Take a look inside Petworth, a close-knit residential neighborhood with local draws that beckon for you to explore. One of Petworth's best-known claims to fame is President Lincoln's Cottage, but while the rest of the neighborhood might not be familiar to visitors yet, residents recognize its unique flair and offerings. From neighborhood gatherings to unique pop-up restaurants and independent shops, Petworth has something special for all visitors. Dig deeper and discover both one-time and all-the-time activities to enjoy in this neighborhood throughout the year. Petworth is known for its community events. Held in early summer, Celebrate Petworth is an annual event anchored around art, music, food, healthy living and family. You’ll want to visit the festival’s Arts Zone, featuring local arts vendors, clothing boutiques, live muralists and performance artists. Little ones will love the Kids Zone, which includes crafts, a puppet theater and storytime. The Petworth Jazz Project is a free music series held in Petworth Park at 8th and Taylor Streets from May through September. Past performers include Kris Funn, Herb Scott and Akua Allrich. Have an interest in arts and crafts? Petworth’s Upshur Street Handmade Art & Craft Fair is an annual event held each December featuring vendors, sponsors, performers, shoppers, entertainers and local businesses who crowd the sidewalks for a fun neighborhood celebration. Home cooks will want to visit The Petworth Community Market, a weekly farmers' market held on Saturdays from May through November. The market features produce, prepared food and local vendors such as Sweet Crimes, Panorama Bakery and Harrar Coffee & Roastery. The market also hosts performances by musicians and artists, as well as chefs who put together cooking demonstrations. Exploring the neighborhood’s restaurant scene is also a must – Petworth is home to not one, but two, of Bon Appétit's best new restaurants in America for 2017. Himitsu, the no reservations, quaint 24-seat restaurant inhabiting the Upshur strip, delivers on what first-time restaurateurs Kevin Tien and Carlie Steiner call “New Japanese.” And just across the street is Timber Pizza Co., a former food truck turned brick-and-mortar that's been wowing pizza lovers in a cool, industrial chic space. Bookworms will love Upshur Street Books. Discover quirky picture books, books about DC’s past and present, work from local authors (politicians included), essay collections, novels, puzzles and much more. If you like enjoying a cocktail while reading, head to the Petworth Citizen & Reading Room. The classy spot is a neighborhood literary bar and restaurant with friendly service, tasty food and delicious drinks. Reading with a cocktail at Petworth Citizen & Reading Room, visiting the Petworth Community Market on Saturday mornings. The neighborhood is anchored by the Georgia Avenue-Petworth Metro station on the Green Line. The 60-64 Metrobuses also run along Georgia Avenue towards Silver Spring to the north and downtown DC to the south. Cozy, comfortable, cool – Petworth is an up-and-coming DC neighborhood that’s fun for the whole family. From kid craft festivals to quirky bookstores and bistros, you’ll always have something new to do. 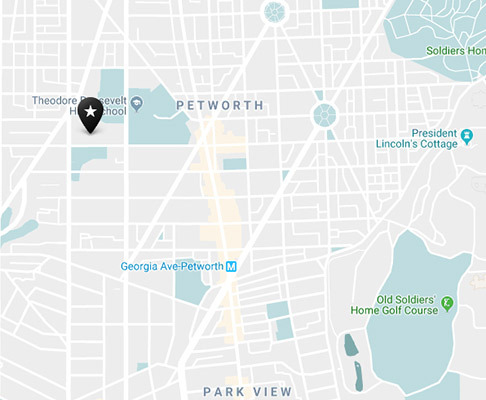 Click below to learn more about what you can do in Petworth.